I don’t mean you can make ribs in the oven or grill while you shop online. You can, but this is better. The weather is great for a minute! Go outside! I really think slow cookers are worth the counter space, especially for busy folks. And I have precious little counter space. A lot of people have visions of mushy stews and everything tasting the same when it comes out of the crockpot, but really, anything that you braise can be slow-cooked, especially if you’re willing to do a little prep work. 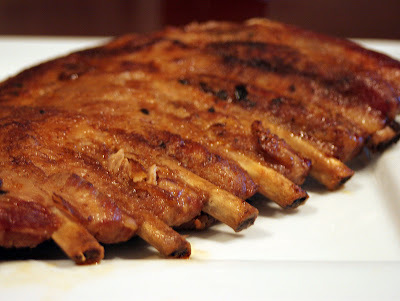 They may not be for the purists among you, but for the rest of us, these ribs are tasty, and cheap, and easy. Isn’t that a worthy trifecta? Rub ribs with paprika, garlic powder, and chili powder. If you have time, refrigerate after rubbing for 1-3 hours. Zest oranges and lemon. Juice oranges and lemon, adding juice to the slow cooker. Crumble chipotle and add to slow cooker. Bring ribs to room temperature if you refrigerated them. Brown each half of the rack of ribs on both sides in a heavy skillet. Add first half to slow cooker, pour a little barbecue sauce on top, then add second half. Add beers, then top off with more barbecue sauce. Add about 3/4 of the bottle of barbecue sauce total. Ideally ribs will be just submerged in liquid. If you have time, cook ribs for 10-12 hours on low. This way they will be most tender. If not, cook for five hours on high. Remove ribs from liquid (discard liquid), serve with the rest of the barbecue sauce and hot sauce. If you’re preparing these overnight, refrigerate ribs submerged in the cooking liquid (in a casserole, not your slow cooker insert) during the day. Before heating, remove fat from surface. Reheat in the oven, finishing with a quick broil to crisp them up if you want. Yum!! Oh my goodness - I can’t believe this is a slow cooker recipe! Wow, slow cooker! THe meat must be really really tender! They look really delicious! I’m a huge fan of the slow cooker! Probably use it once a week. I especially love how it fills our apartment building hallway with the amazing smells which tricks the neighbors into thinking we are slaving over a hot stove all day. 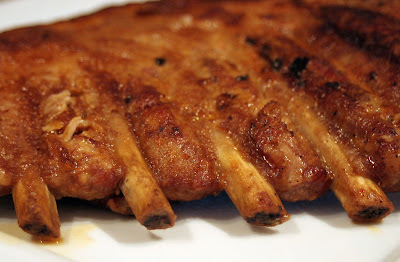 These are some good lookin’ ribs…look at all that exposed bone…means fall off the bone kinda’ good. I’ve often said that “nothing good can come from a slow cooker”… and I’ve come to realize in the past year or two that I am DEAD WRONG. Those ribs look fab. Gotta try em. whoa! this is amazing. why have i never thought about doing ribs in the slow cooker? is the meat as “tough” like when it’s been cooking on the grill for a long time or is it more ‘fall off the bone” in texture? just curious. These were sort of halfway between fall-off-the-bone braised meat and something a little sturdier. You could vary the liquid…if they’re not immersed, they’ll be less dissolvingly soft. Oh, I love ribs so much. SO MUCH. They’re worth The Itis.